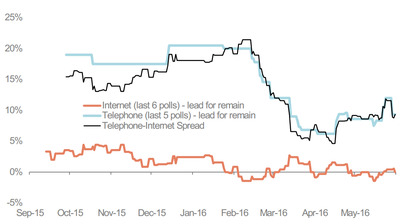 The results of at least one EU referendum phone poll are expected to be released this week — probably more. These phone surveys will represent the most important opinion polls for the Leave campaign to date. If these phone polls echo what the online polls published by TNS and YouGov over the weekend indicated — that Leave is in the lead — then we can assert that a significant swing in favour of a Brexit is definitely underway. This is because the story of polling for most of the referendum campaign has been a consistent discrepancy between the two modes: Phone polls have given leads to Remain, while surveys conducted online have indicated leads for Leave. This is illustrated in the chart produced by Morgan Stanley below. So yes, the online polls published recently made positive reading for Brexiteers — but this really wasn’t anything new or surprising. However, if phone polls published later this week were to give leads to Leave too, then this would be hugely significant for two reasons. Firstly, it would mean that a convergence between the two modes will have taken place. This would mark a clear break from the phone/online discrepancy and would indicate that a significant shift in public mood has been detected across multiple numerous surveys. Secondly, it would mean that the pro-Brexit swing will have sustained over time. This is important as Leave has led in past polls but only for short amounts of time. Unless the results of phone polls released this week show that Leave is in the lead, then analysts and bookmakers are unlikely to change their prediction that Britain voting to stay in the 28-nation bloc is the most likely outcome on June 23. According to polling analyst Matt Singh’s live referendum forecast, the chances of a Brexit taking place have improved but only very slightly, while the probability of Remain winning is 77%. It’s for this reason that all eyes should be on the results of this week’s EU referendum phone polls. If they show leads for Leave, this would mean that the campaign for Britain to leave the EU is gathering a lot of pace, with just over two weeks until the referendum.